There was a relative flurry of transfer activity as the Blues secured the signatures of Ecuadorian midfielder Segundo Castillo and Luis Saha…at least I think they have as news of the transfers have all been a bit hazy to say the least. What's not hazy is the fact that, despite signing three players, Everton still haven't spent any money at all, which is quite simply not good enough in a season where we were meant to 'kick on' and 'try and break the top four'. Quite who's to blame for this is anybody's guess. The 'dithering Dave' brigade have come out and blamed the manager but then these are the same people that want the manager deposed the second there's a slight downturn in fortunes. Other people suggest that the buck stops with Bill Kenwright and the Everton board for not releasing any funds despite the fact that we have pulled in about £16 million from the sales of James McFadden and Andy Johnson alone. That's before we even get onto the supposed £2 million we got off Manchester United for conspiring to win the Premier and Champions Leagues with the fat lad stomping around for them, and the £300 gazillion we get off Sky to give them the right to change our games to a Tuesday afternoon should they so wish. The truth probably lies somewhere in the middle but, no matter who's to blame, it's simply not good enough. And David Moyes is clearly getting exasperated by the situation as his interviews are becoming more and more bizarre as he becomes more and more outspoken. His post-match comments after the Portsmouth collapse, the ones where he basically said the team we've got is not fit to win a Premier League game, are not the sort of thing you ever want to hear from your manager. But, short of coming out and saying the board are a bunch of penny-pinching wide boys, I guess it's his way of saying that he's not happy with the way things have gone this summer. And, for the first time since he took over, I feel that he has taken us as far as he possibly can. Without any serious spending, we can't possibly hope to finish any higher than fifth - and even fifth is looking extremely unlikely at this juncture - and, last season apart, it's also increasingly difficult for any team outside the 'top four' (God, I hate that!) to actually win a trophy! Which brings me nicely on to the next season-shaping event, the UEFA Cup draw. As soon as I heard that Standard Liege weren't seeded I knew it was a nap that we'd get drawn against them! Of all the bad draws that we've ever been handed, and we've had a few of them, that one is up there with the worst of them, especially given the way the battered the Shite over two legs. And I just can't get my head around the fact that Everton, surely the top seeded English team in the UEFA Cup given our European experiences over the last few seasons, can draw effectively a Champions League team. Man City get Omonia, which sounds like something your Mum would torture you with as a kid if you went in with a grazed knee, Portsmouth get Guimarães - who? - and Aston Villa get Litex, that well known brand of correction fluid! The only other team with anything like our recent European experience, Tottenham, also got stitched up in getting Wisla Krakow. Oh yeah, and we're at home first…exactly what advantage has being seeded given us?! Then Saturday rolled around and I made my inaugural trip to Goodison for the nailed-on three points that is Portsmouth at home. I really don't need to go on do I…?! 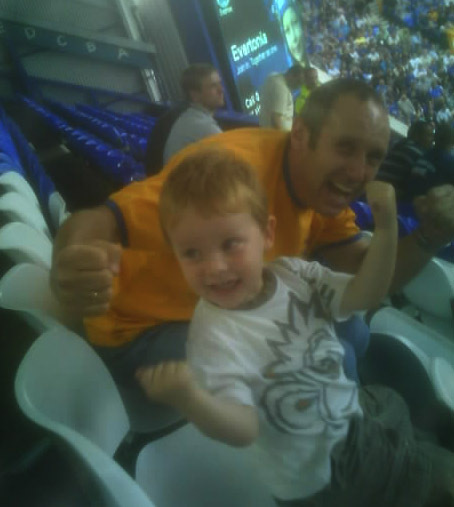 But I will just to say that only good thing about the day was that it gave me a chance to take Les the Ed junior to his second Everton game and we had great fun walking up and down the Upper Bullens and slamming the seats up and down. Honestly, things are that bad that you have to make your own entertainment at the game these days! Picture was obviously taken before a ball had been kicked!